Recently I was looking up something on a map, and my eyes were drawn to the Kerguelen Islands at the bottom. They seemed quite substantial, yet I’d never heard of them. It turns out they belong to France, are uninhabited except for a few scientists, and are full of penguins and cabbages. Sailors used to stop off there to have a grim cabbage feast to fend off scurvy. 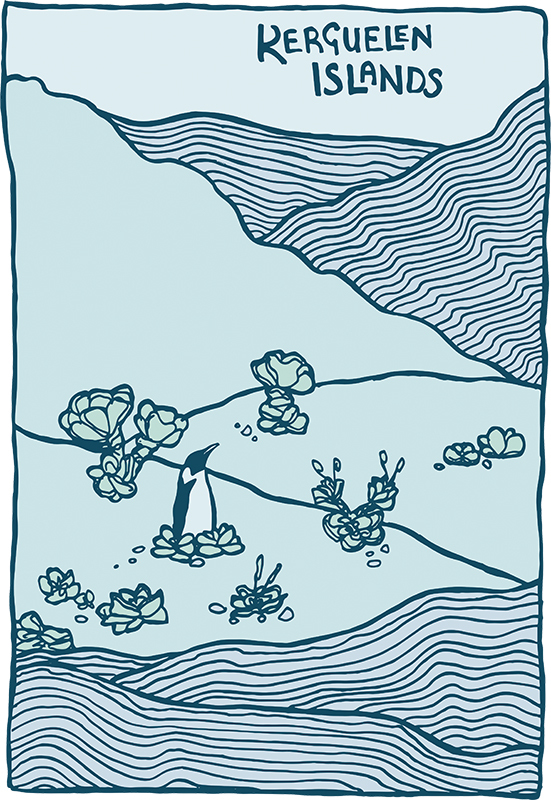 Here is a lonely penguin in the cabbage fields. I will never have another reason to draw that. The picture is available as a print and various other items on Society 6.